My son is two, and he likes coffee, but I never have. I have always liked the smell, but no matter how much sugar or ‘cream’ I would add, it always tasted bad to me. A few years ago, when we were in Costa Rica, I found a really delicious chocolate coffee. I bought a couple bags and started drinking it every day. Like so many others, I finally had my coffee habit, and it was quite comforting to sip a warm drink throughout the morning. The only problem is that I am extremely sensitive to caffeine, possibly intolerant or allergic to it. It makes me extremely paranoid and fearful, I can’t sleep well, and triggers panic attacks. While I loved my chocolate coffee, and I love hot and iced tea, I had to stop drinking it. Then I discovered Teeccino. It’s a caffeine free ‘coffee’ that is non-acidic and made from chicory root. They offer several different flavors. It can be brewed like regular coffee or you can buy unique single serving tea (coffee) bags. This is really convenient if you want to travel with them or if you just want to heat up water instead of turning on the coffee maker. If you go to their facebook page, you will see an offer for a sampler of 10 different flavors for $10.99 including shipping. This is what I purchased to find my favorite. Their website also has a lot of good information on caffeine and how it affects your body. Especially for pregnant or nursing moms, it’s important to limit the amount of caffeine you are taking in, if you are drinking any at all. Even if caffeine doesn’t have a noticeable affect on you (like it does for me), it does affect your body in other ways that you should be aware of. The website will also tell you where you can find a store near you to purchase Teeccino or you can buy it online. It is so nice to have a warm, comforting drink on these cold, winter days. I add a little sugar and some soy creamer and drink it throughout the day. I’ve also poured it over ice to make a cold drink which is nice when the sun is out and the weather is a little warmer. I’m really glad I found this! 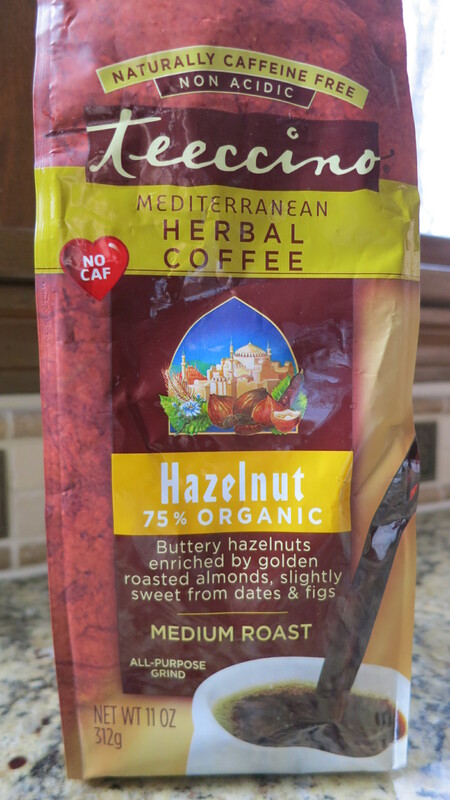 This entry was posted in Favorite Things, Uncategorized and tagged caffeine free, chicory root, coffee alternative, morning drink, pregnant and nursing moms, teeccino. Bookmark the permalink.